A simple, effective Mega single shot. 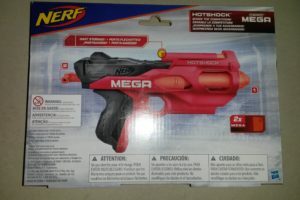 The Hotshock is a small, simple Mega blaster that was released back in 2016. 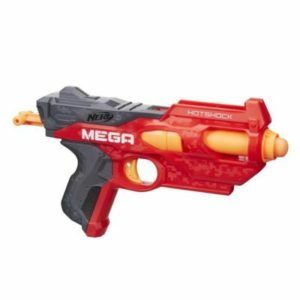 I paid very little attention to it at the time as I had little interest in Mega or single shot blasters. 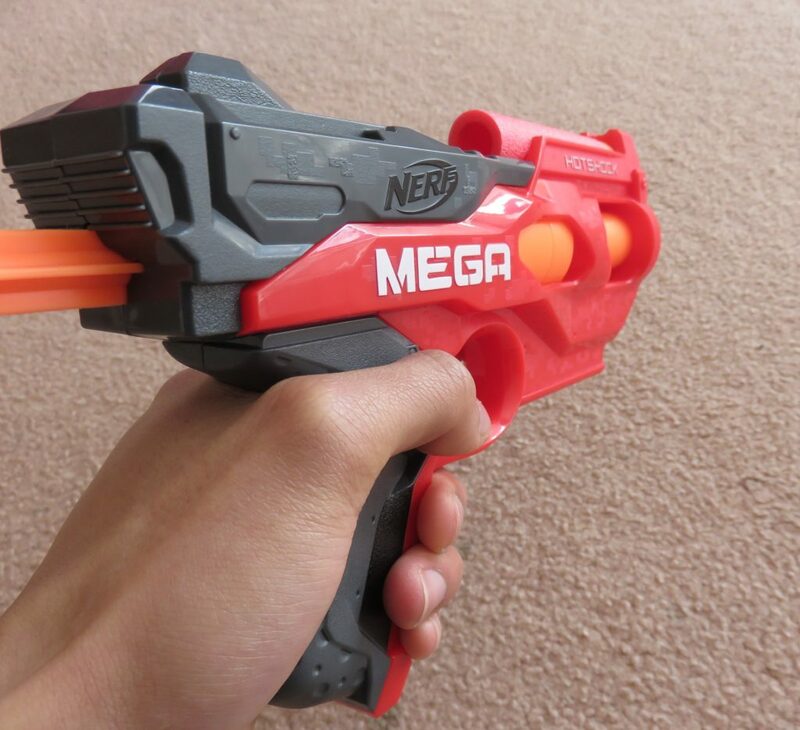 However, MHvZ recently introduced the Mega zombie, a zombie only stunnable by a Mega dart. 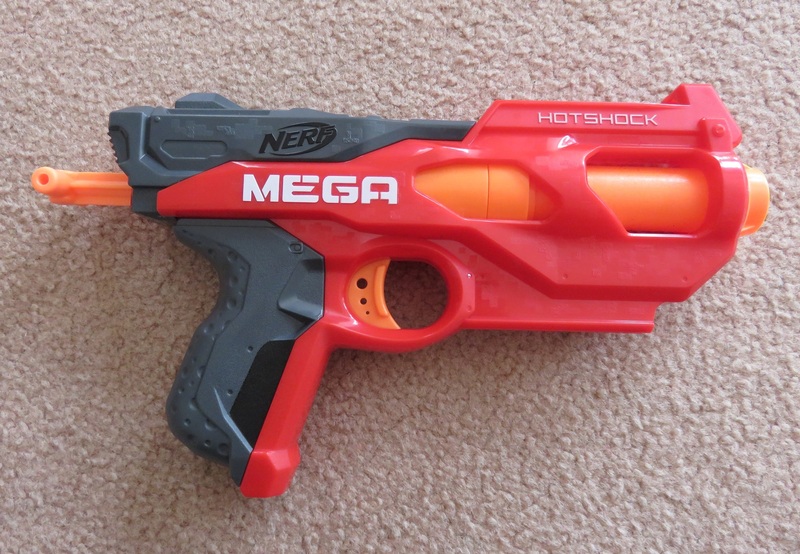 As they are severely limited in number, I chose to pick up just a basic Mega blaster to combat them. Everything in the Hotshock box. Nothing of notable interest in the box. 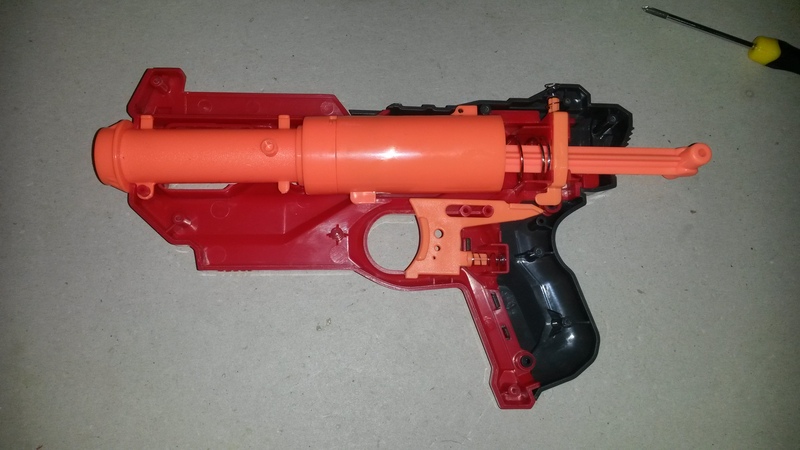 Another angle of the blaster loaded up. 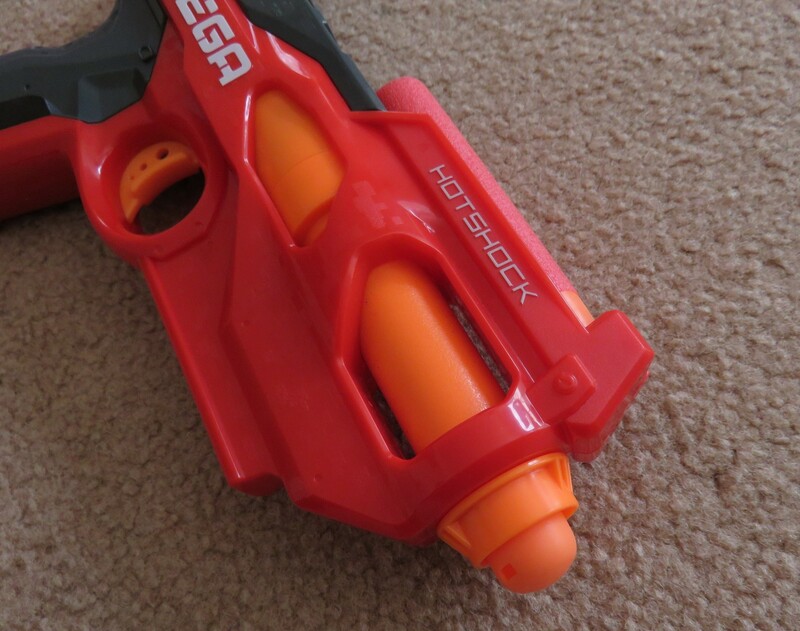 The Hotshock is a very simple blaster, very few bells or whistles. It’s pretty much all that’s necessary to have a plunger tube, a barrel and a handle. Fairly standard Mega styling as well. Another angle of the handle. I have a couple of issues with the handle. Firstly, while the rear of it is quite nicely curved, the front edges are quite angular and sharp. 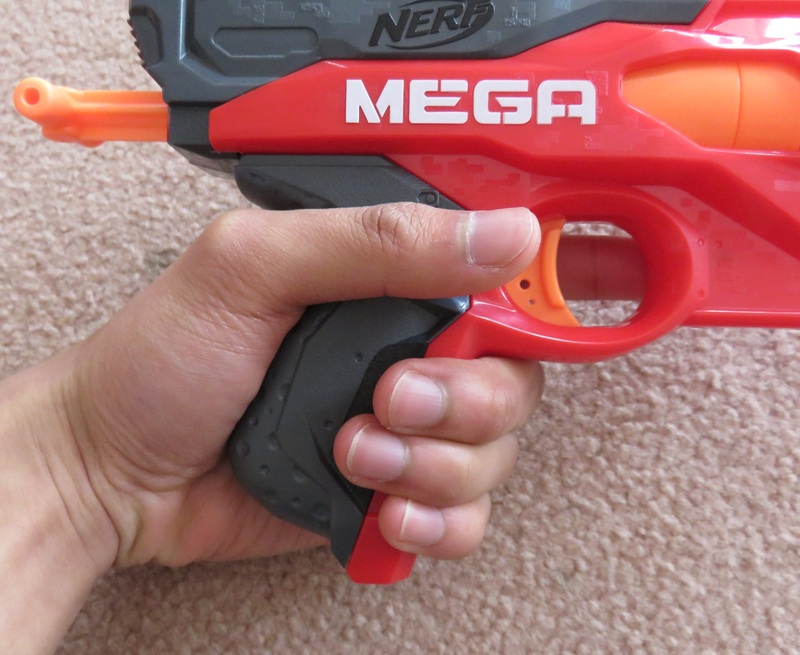 I find it a little uncomfortable to grip tightly, as those edges dig into my fingers slightly. The bottom protrusion is also particularly uncomfortable. It is not only sharp edged, but also wider than the rest of the handle. With my grip, I find that my pinkie rests right on this protrusion, which I find to be especially uncomfortable. There is also the issue of length. 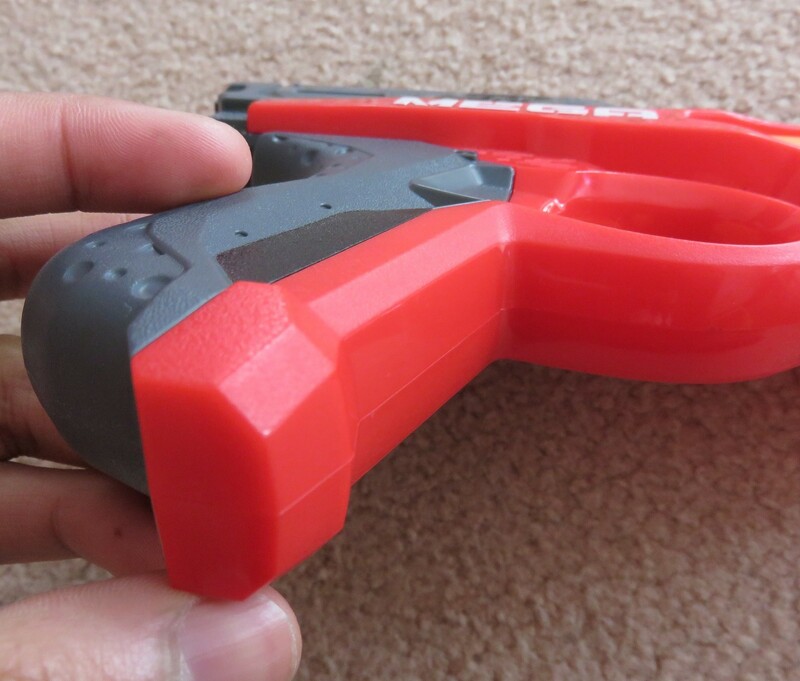 The Hotshock’s handle is rather stubby and short, and my fingers barely all fit on it. I think that it would have benefitted from a little more length, as it would also have moved the aforementioned protrusion out of the way as well. Close up of the plunger rod. The Hotshock is a standard pull-back to prime blaster. It has a draw of roughly 5cm. Though I feel that the plunger handle could have been a little wider, it is still quite easy to grab and prime as is. Close up of the dart holder. 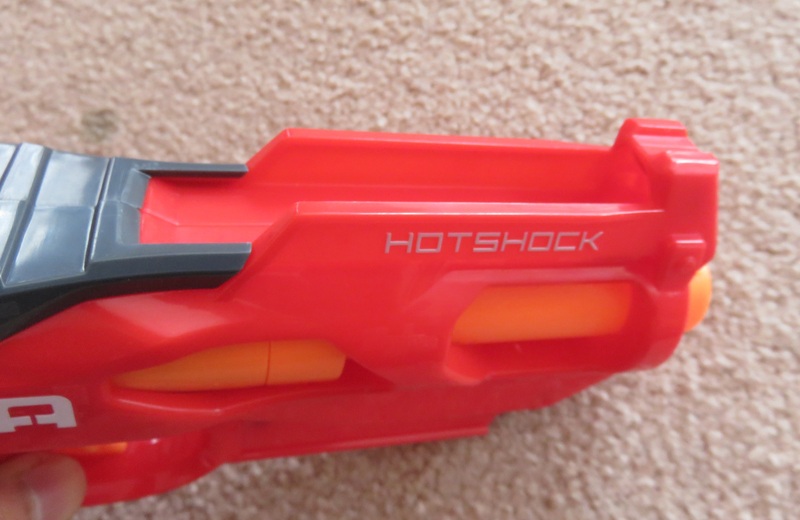 The Hotshock’s one special feature is its ability to hold a spare dart above the barrel. This dart is held in purely by friction. 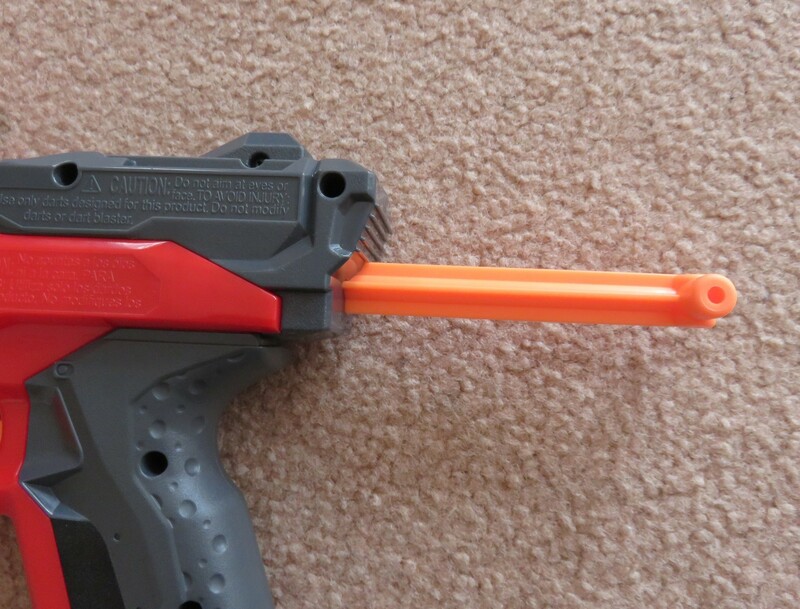 It can be removed with ease, and a new dart can be inserted just as easily. 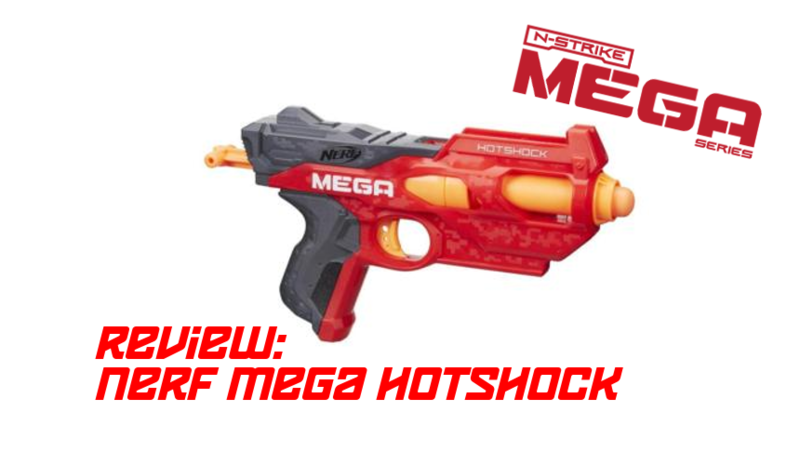 Range wise, the Hotshock typically achieves around 10-14 metres with the included Mega darts. 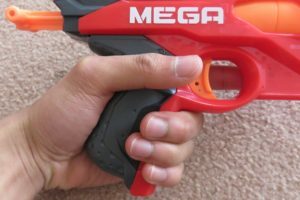 Nerf Mega darts are extremely inconsistent, and there is no guarantee which range extreme the next dart will fly to. Accuracy, thanks to the extremely inconsistent Mega darts, is incredibly poor. Beyond around 6 metres, the darts quite often swerve and veer into random directions. 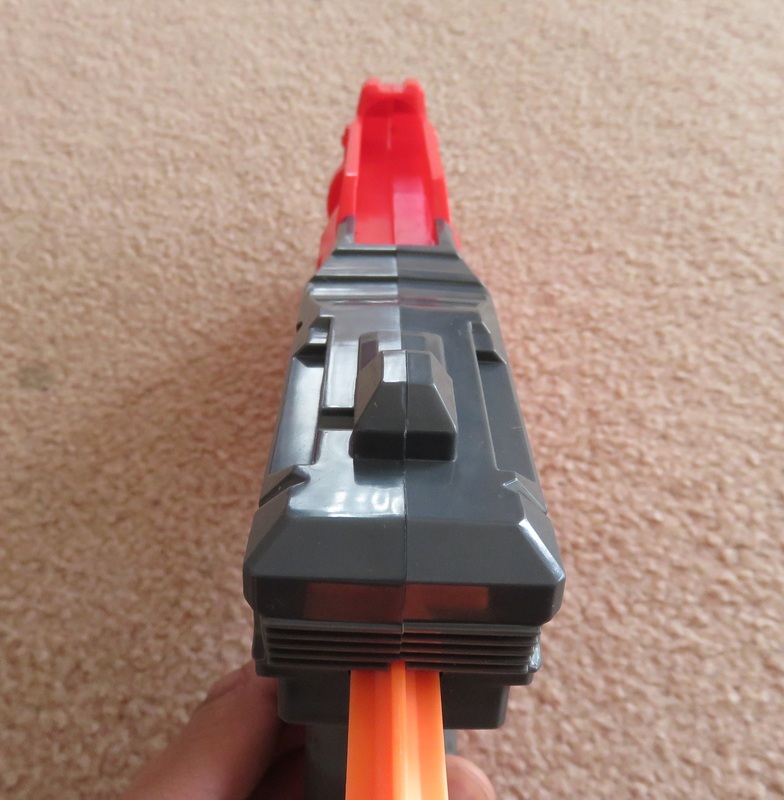 Rate of fire is pretty standard for a single shot blaster. 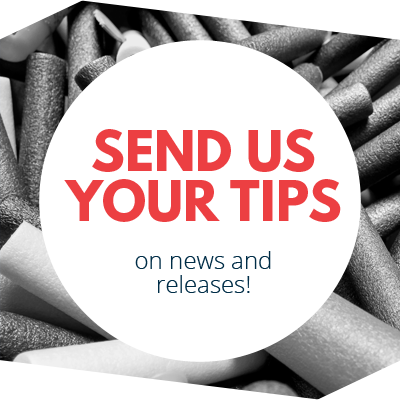 A dart every two or three seconds is possible and sustainable with good technique and practice. 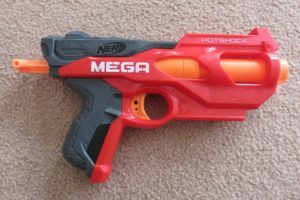 The Hotshock is a relatively compact single shot Mega blaster. 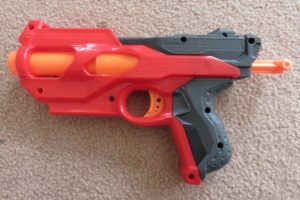 It is easily holstered or otherwise stored and carried, and is reasonably powerful. 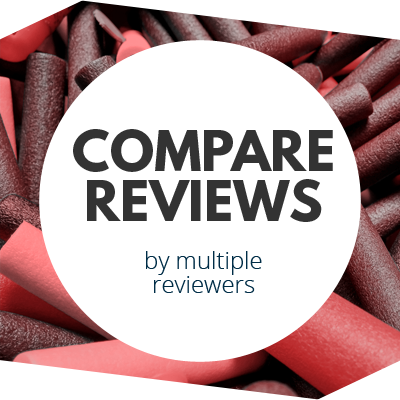 It faces competition primarily from the Bigshock, which is smaller and more compact, however the Hotshock has a larger plunger tube and a more ergonomic shell. 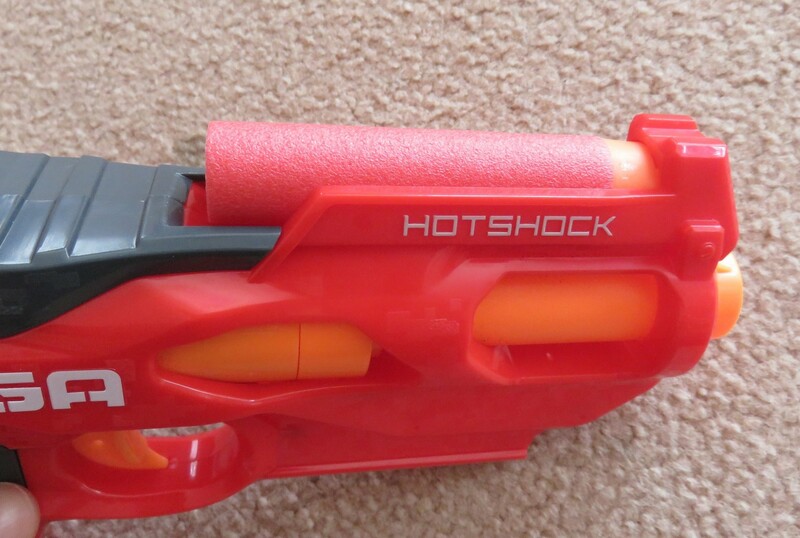 As a single shot blaster however, the Hotshock is not going to be much good as a primary blaster. 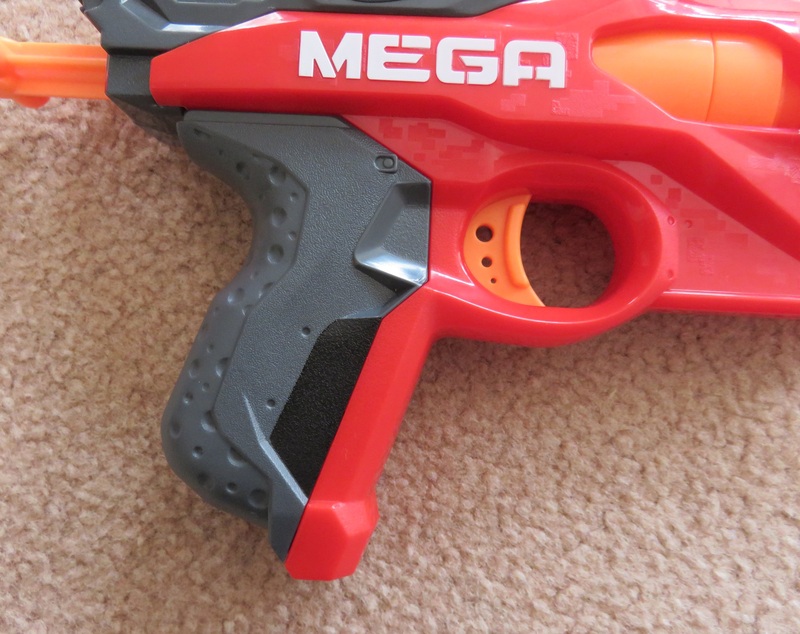 Its best use is as a secondary/sidearm purely for use against targets vulnerable only to Mega darts (e.g. Mega zombies). In this role it functions quite well, provided its targets are few in number. 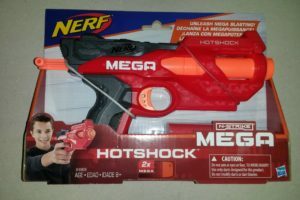 The Hotshock is currently available in Australia for 15AUD from BigW. 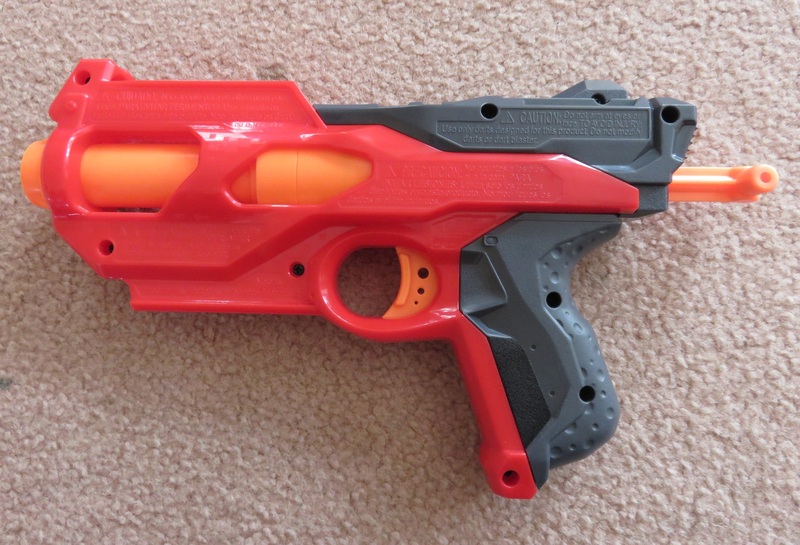 For comparison, the Strongarm typically retails for around 10-20AUD, depending on store. 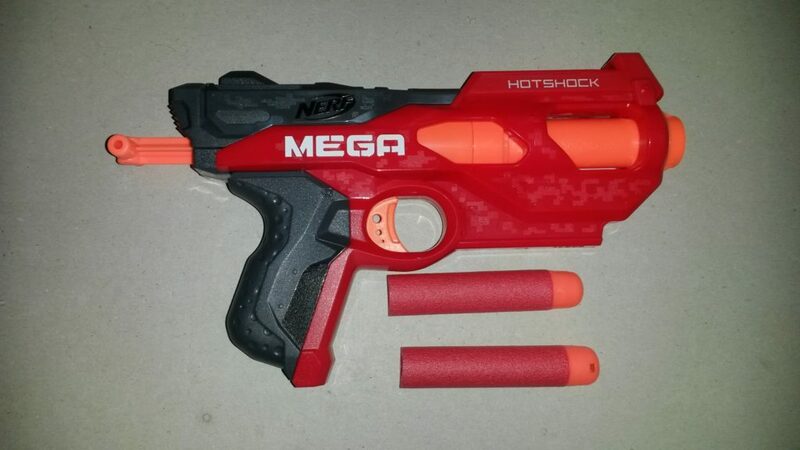 The Bigshock is a TRU exclusive that retails for 20AUD. 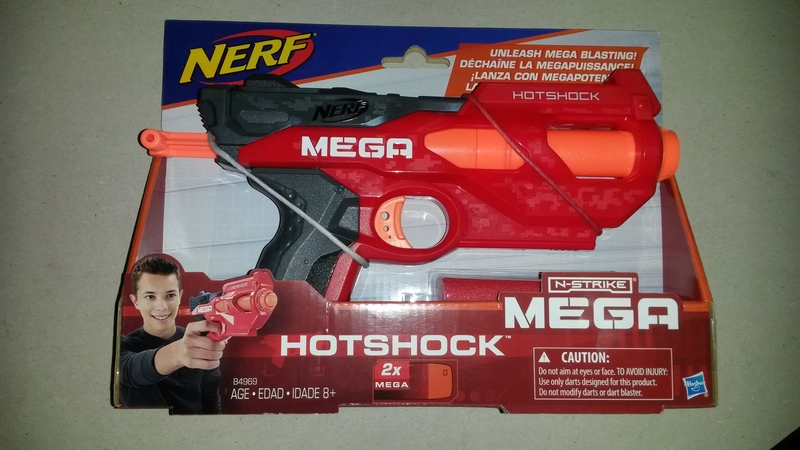 Since the Bigshock suffers from TRU overpricing, the Hotshock is the cheapest Mega blaster in Australia. For its price, it is a reasonable, though not exceptional, deal. 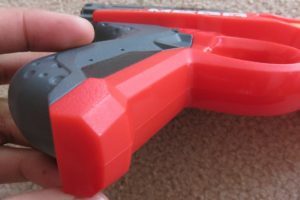 It functions fairly well in stock form, and it also packs a good amount of modding potential with its sizeable plunger tube. 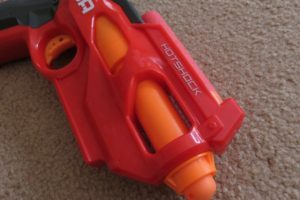 If you’re after a basic Mega blaster, or a cheap single shot that you can mod into a powerful blaster, the Hotshock is certainly worth a look. 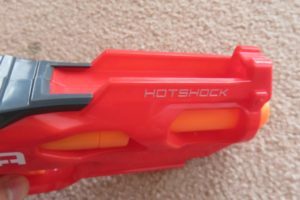 Internally, the Hotshock is extremely simple. 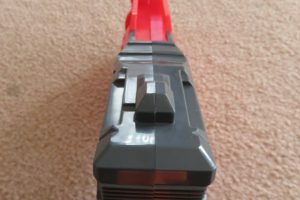 It is no different to the plethora of other single shot blasters out there, featuring a decent sized plunger tube leading directly into the barrel. 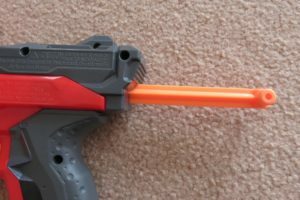 Its simplicity and plunger tube size offer substantial modding potential, and it is entirely possible to attain 150fps from Elite type darts, or even more. 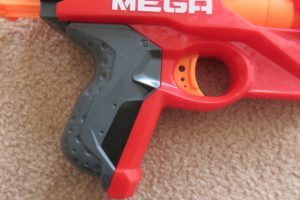 This entry was posted in Dart Blasters, Reviews and tagged hotshock, mega, nerf, review on October 6, 2017 by Outback Nerf. I’m new here.. Where are you based? 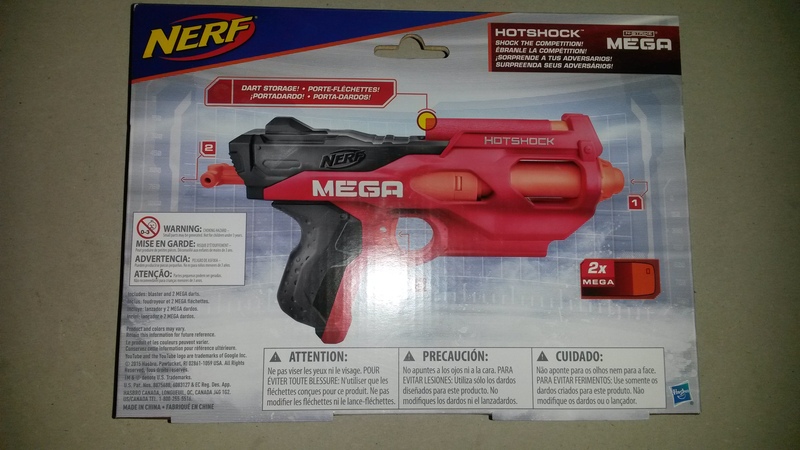 I don’t think this blaster was released in the US. I found mine at Big Lots (here in the US) for $10. Australia, as mentioned in the post itself. Ah, must have missed that bit. Very good. I found it on eBay for $17usd, might have to pick it up soon. 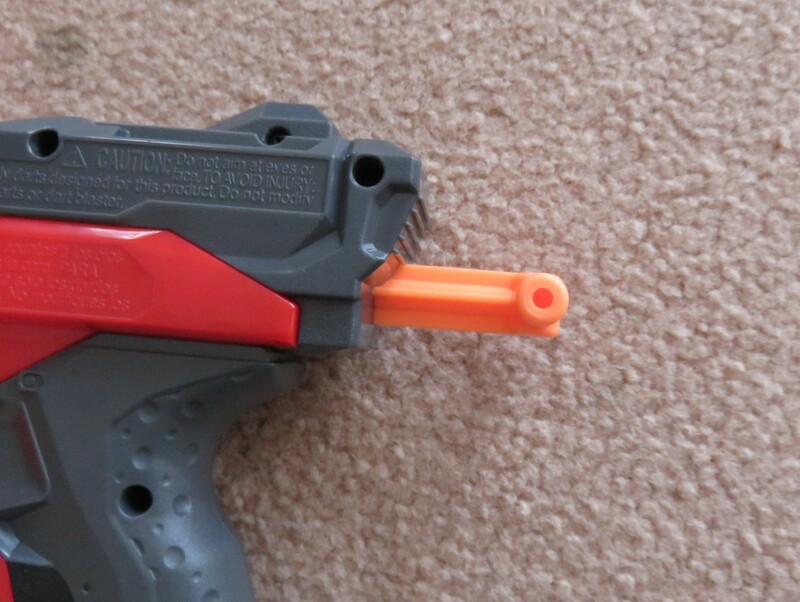 Now, I am wondering, is this Hot Shock from the US, because that is a orange and not a grey trigger. 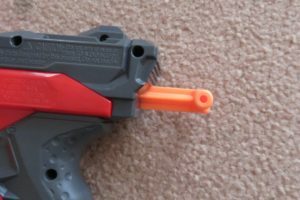 There doesn’t seem to be a grey trigger model, as mentioned in the post, I bought this in store in Australia. OK, apologies I didn’t see that. And thanks for the reply.